When major volcanic eruptions occur—such as Tambora in 1815, or Krakatoa in 1883, or Mount St. Helens in 1980, or Mount Pinatubo in 1991—huge clouds of sulphur and volcanic ash enter the atmosphere and stratosphere, traveling around the globe and causing air quality issues, crop failures, and global temperature changes. But the eruption ends, and, while volcanoes can cause severe environmental damage, the most common eruptions affect Earth’s ecosystems for only few years. However, unlike an actual volcano, the so-called “human volcano” continues to increase steadily over time. There is no end to the eruption—industrialized nations continue to erupt, slowly and without pause. So, while a volcanic eruption is more catastrophic and destructive in the short term, the human volcano can be more long-lasting, producing what climate scientists call “global warming.” Humans, in other words, have become a geophysical force of nature akin to volcanoes. Humans’ ability to modify Earth’s ecosystems in this manner is a hallmark of the Anthropocene. Literally meaning “The Age of Humans,” the Anthropocene is the proposed name for our current geological epoch, beginning when human activities started to have a noticeable impact on Earth’s geology and ecosystems. Nobel-prize winning atmospheric chemist Paul Crutzen popularized the term in 2000, writing that the Anthropocene refers to “the present, human-dominated, geologic epoch, supplementing the Holocene,” and his writing has spurred nearly two decades of debate among scientists and humanities scholars, with most scholarship centered on defining the characteristics of the Anthropocene and in establishing its dates . Crutzen initially proposed that the Anthropocene began with the Industrial Revolution, citing James Watt’s patent of the steam engine in 1784 as a possible marker, while other scientists have since argued for the “Orbis spike” of 1610 or the “bomb spike” of 1964. The later date has recently emerged as the frontrunner for the dating of the Anthropocene . However, the human-volcano effect directs our attention back to the eighteenth century as marking the emergence of the Anthropocene. 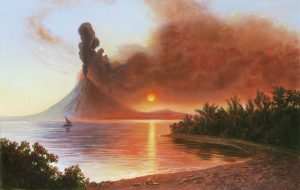 This human volcano, it turns out, is not unique to our contemporary moment: the practice of comparing human activity to volcanoes is part of a literary tradition that began in Britain in the eighteenth century. Poets, painters, and scientists were fascinated by volcanoes, due in large part to the dual developments of geology and industrialization, as well as the high number of major eruptions during this period, most notably Vesuvius in 1737, 1760, 1767, 1779, and 1794; Laki in 1783; and Tambora in 1815. 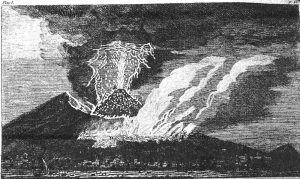 Eighteenth-century geologists argued that volcanoes played a vital role in the formation and evolution of Earth. The violent eruptions of volcanoes and subsequent processes of erosion, decay, and rejuvenation not only imagined a geological time scale for the first time—that is, “deep time”—but also made volcanoes a major attraction for natural historians and tourists alike. At the same time, a range of authors began using volcanic language and imagery in the earliest depictions of industrialization, which was quickly reshaping the landscape and geography of Britain. This conflation of human and geological phenomena depicts humanity as a geological force in a new geological epoch. Welcome to light, advent’rous pair! Several words and images here reference volcanic eruptions: “sulphuruous damps,” “subterranean thunders,” “Aetnaean sound” (reference to Mount Etna), “trembling mountain,” “flaming mouths,” “burning rocks.” The sights, sounds, smells, and effects of the coal mines parallel those of volcanoes. The footnotes are also quite suggestive. In the first footnote, the author writes of the “dreadful explosions” in the mines, which are “very destructive,” “bursting out of the pits with great impetuosity, like the fiery eruptions from burning mountains” (pp. 1–2). He here refers to natural coal-seam fires, which can burn for thousands of years, but which can also be started by human causes, such as accidents and explosions in mines. In the second footnote, he explains that these unintended fires “burn for ages” (p. 2)—an exaggeration, of course, but one that implicitly links the long, slow progress of a geological age with the experience—and projection—of humans’ imagined geologic imprint. What terrors still your steps await? Dalton depicts water pumped from the mines as a kind of hellish water, or lava, akin to the fiery water of Acheron in Hades. In a footnote, he explains the pumping process in more detail, offering a vision of anthropogenic lava: “The water that flows from the coal is collected into one stream, which run towards the fire-engines. This water is yellow and turbid, from a mixture of ocher, and so very corrosive, that it quickly consumes iron” (p. 8). Dalton’s Descriptive Poem indicates the trajectory of scientific poetry throughout the eighteenth century. The structure of the poem, which alternates between poetry and extensive scientific footnotes, not only anticipates the style made famous by Erasmus Darwin nearly four decades later but also points toward a confluence of scientific and literary writing on volcanoes and industry. Poets and geologists alike wrote extensively of volcanoes and industrialization, often at the same time. For example, the first English translation of Italian geologist Francesco Serao’s Natural History of Mount Vesuvius was extracted and written about extensively in a 1747 issue of the Gentleman’s Magazine and in subsequent issues throughout the 1750s and 1760s. Focused mainly on the 1737 eruption of Vesuvius, this text exemplifies the kinds of descriptions typical in volcano writings, with an emphasis on fire, heat, smoke, clouds, thunder, earthquakes, and a transformation of the surrounding landscape. Significantly, he frequently compares volcanic activity to human effects: he repeatedly refers to underground volcanic fires as “furnaces”; compares volcanic vapors to those in coal mines; and writes, “The Noise of our Vesuvian Thunder was momentaneous, like the Discharge of a Cannon fir’d at Sea” . 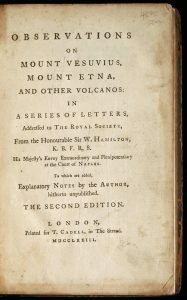 Scientist and explorer Sir William Hamilton also focuses on volcanic-industrial connections in his popular and widely-read Observations on Mount Vesuvius, Mount Etna, and other Volcanos (1773). Like Serao’s text, Observations was extracted and reprinted frequently in literary magazines. At one point, Hamilton compares the smoke and ash of Vesuvius to the fog of London: “it was impossible to judge the situation of Vesuvius, on account of the smoak and ashes, which covered it entirely . . . the sun appearing as through a thick London fog” . As we know now, London’s famous fog was mostly the result of suspended particulate matter: soot, smoke, and dust caused from coal burning. In 1825, Charles Lamb would call this “the ‘London particular,’ so manufactured by Thames, Coal Gas, Smoke, Steam, and Co” . 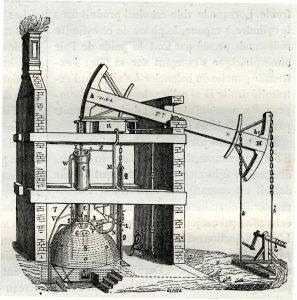 These kinds of scientific-industrial comparisons were widespread in scientific writings: perhaps most famously, the geologist James Hutton presents Earth as a “machine” modeled on the steam engine in his Theory of Earth (1788). By the early nineteenth century, the volcanic-industrial tradition had become “common place” in British writing, as Lord Byron observes in Don Juan (1824) . 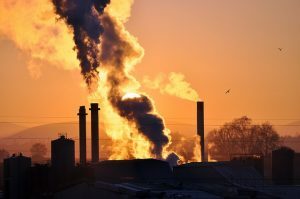 Scientists such as Humphry Davy, James Smithson, and Luke Howard began to argue explicitly that industrial emissions had atmospheric effects similar to those of volcanic eruptions. In 1804 the editors of the Edinburgh Review expressed amazement that such a connection had “so long eluded observation” . Howard, writing on London in 1812, referred to the chimneys of the city as a collective “volcano of a hundred thousand mouths” . In 1820, the poet James Woodhouse wrote of the “new volcanoes” in Birmingham and Wolverhampton . This literary trope of referring to the “new volcanoes” of industry continues throughout the nineteenth and twentieth centuries. In a 1902 issue of the Illustrated London News, the thousands of chimneys that reach into the sky above Britain’s capital are referred to as “London volcanoes,” and today, climate researchers continue to write of the “human volcano” . In the twenty-first century, humans have supplanted volcanoes as a major catalyst of climate change. The last five years (2014–2018) were the hottest years on record globally, owing almost entirely to the human-volcano effect. While this warming trend is recent, the connections among industrialization, volcanoes, and climate change are not. 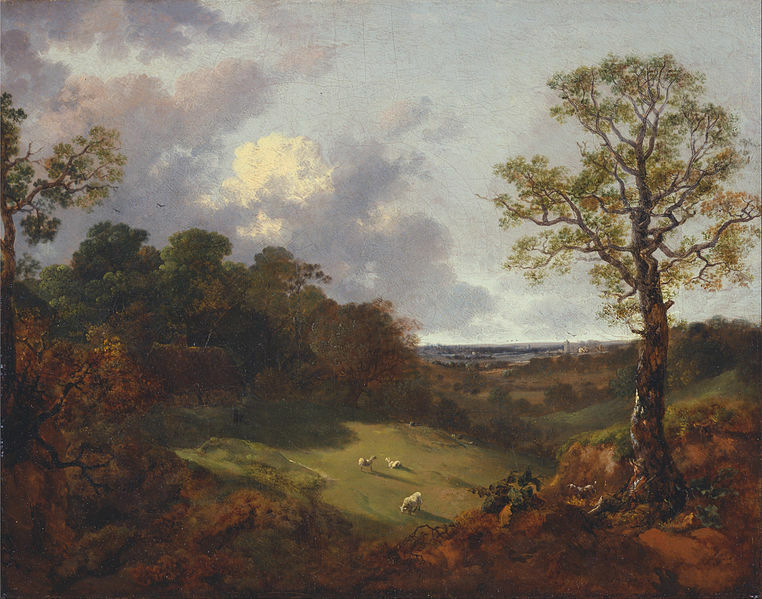 These connections, which both signal and describe the Anthropocene, form a tradition in eighteenth-century British writing, pointing to 1750 as the dawn of the Anthropocene. Paul J. Crutzen and Eugene F. Stoermer, “The ‘Anthropocene,’” IGBP Newsletter 41 (2000), p. 17. For a concise yet comprehensive overview of these debates, see Jeffrey Davies, The Birth of the Anthropocene (Oakland: University of California Press, 2016), esp. chapter two. Also see Simon Lewis and Mark Maslin, “Defining the Anthropocene,” Nature 519 (2015): 171–80. John Dalton, A Descriptive Poem, Addressed to Two Ladies, at their Return from Viewing the Mines near Whitehaven (London, 1755), ll. 1–12. Francesco Serao, The Natural History of Mount Vesuvius (London, 1743), p. 64. Sir William Hamilton, Observations on Mount Vesuvius, Mount Etna, and other Volcanos (London, 1774), p. 31. J. C. Thompson, Bibliography of the Writings of Charles and Mary Lamb: A Literary History (London: J.R. Tutin, 1908), p. 88. Lord Byron, Don Juan, 13.282. Quoted in G. M. Matthews, “A Volcano’s Voice in Shelley,” ELH 24, no. 3 (1957), p. 197. Luke Howard, The Climate of London (Cambridge: Cambridge University Press, 2012), p. 203. James Woodhouse, The Life and Lucubrations of Crispinus Scriblerus, in The Life and Poetical Works of James Woodhouse, ed. R. R. Woodhouse (London, 1896), p. 25. Illustrated London News (15 March 1902), p. 17. This essay of a Bard unkend. The Scottish poet Gavin Turnbull (1765-1816), a younger contemporary of Robert Burns, published two books of poetry in Scotland before emigrating to America in 1795, where he contributed poetry to South Carolina newspapers. 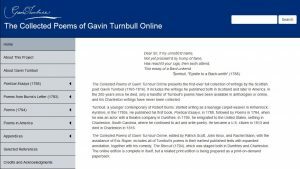 The Collected Poems of Gavin Turnbull presents the first-ever full collection of Turnbull’s writings. Turnbull, born in the Scottish Borders, started writing poetry as a teenage carpet-weaver in Kilmarnock, Ayrshire, in the 1780s. He published his first book, Poetical Essays, in 1788, followed by Poems in 1794, when he was an actor with a theatre company in Dumfries. In 1795, he emigrated to the United States, settling in Charleston, South Carolina, where he continued to act and write poetry, publishing not only in Charleston but also in the prestigious Philadelphia magazine Port Folio. He became a U.S. citizen in 1813 and died in Charleston in 1816. While he twice issued proposals for a new collection of his writings, and a further invitation to subscribers was published after his death, no collection ever appeared. Only a handful of his earlier poems have been available in anthologies or online, and his Charleston poems have never previously been collected. The Collected Poems of Gavin Turnbull contains 89 individual poems and songs, organized according to the date of their first publication. The poems are grouped into one of four sections, following the sequence of the books, manuscript, or periodicals in which they are first found. Turnbull’s two prose prefaces to the poetry (1788, 1794) and his short play The Recruit (also 1794) are included, but placed last, after the poems, as appendices. A list of the individual poems and songs in each section and links to the texts are available in the gray drop-down menu on the left-hand side of the screen. With the few exceptions noted below, this edition only includes each poem once, under the date of its first appearance, and poems that Turnbull subsequently reprinted are not repeated in the later section(s). This edition aims to reproduce Turnbull’s texts as they were encountered by their first readers. The text used is therefore taken from the first published version, and where a poem was printed two or more times, the earliest text is used, though any substantive differences between early and later texts are fully noted. The one exception to this general policy is for Turnbull’s poem “The Cottage,” first published in 1788 with four stanzas, for which the edition uses Turnbull’s expanded version with a fifth, more political stanza, from the 1794 collection, also subsequently reprinted in a Charleston newspaper. After he emigrated to Charleston, South Carolina, Turnbull’s contributions to local newspapers included reprinting some earlier poems, as well as newly-written items. The third major section of the edition contains twenty-five poems, ranging in date from 1796 to 1809. Of the twenty-five, twenty-one are items that Turnbull had never previously published; the four reprinted items are the four songs that Turnbull himself extracted from his play The Recruit for separate newspaper publication, and which are therefore given similar separate status here. 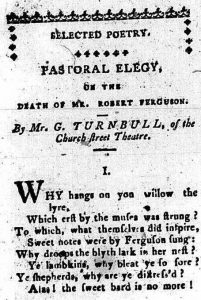 Though he also wrote an ode to General Washington, both in the theatre, where he appeared in such Scottish plays as Ramsay’s The Gentle Shepherd and Home’s Douglas, and in the poetry he published, Turnbull continued after emigration to identify himself as a Scot. 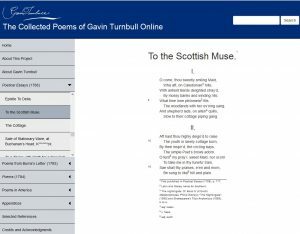 The online edition of The Collected Poems of Gavin Turnbull allows for fuller annotation than will be provided in the planned print edition, especially in glossing words that might cause difficulties for students outside of Scotland, as well as linking to related material, such as contemporary images and music, where Turnbull often specifies the tune to which he has written new song-text. The first note on each text records its publication history, both first publication and any reprinting in Turnbull’s lifetime. The first note may also contain general background information relevant to the poem. Subsequent notes linked to specific lines gloss difficult or distinctive words, suggest literary sources or allusions, and provide historical or background information. Turnbull’s own footnotes to some of the poems, in Poetical Essays (1788) and Poems (1794), have been included but are placed in square brackets, and introduced as “GT’s note,” to differentiate them from the editors’ notes. The annotations are numbered sequentially rather than by line number and can be accessed in one of two ways. The user can move the cursor over a superscript number in the body of the text, so that a dialogue box will appear with the annotation alongside the line it is explaining, or the user can scroll down the poem and find the relevant numbered annotation where the notes are grouped together in sequence at the end of the text. The texts and annotation are supplemented by Patrick Scott’s introductory essay on Turnbull’s life and writings and by a reference bibliography. All text files have been marked-up and prepared in accordance with TEI P5 guidelines—the standard XML language in the humanities—to allow for greater interoperability, both in this edition and future projects. Work on the edition was supported by an ASPIRE grant from the Vice-President for Research, University of South Carolina. The online edition is complete in itself, but Patrick Scott’s selection, A Bard Unkend: Selected Poems in the Scottish Dialect by Gavin Turnbull (Scottish Poetry Reprints no. 10, 2015), is also available, as a print-on-demand paperback and on-line, and a parallel print edition is under consideration. Readers of early British poetry and early women writers will soon be able to discover all of Anne Finch’s poems and plays in the first scholarly edition of her work: The Cambridge Edition of the Works of Anne Finch, Countess of Winchilsea, general editor, Jennifer Keith: Volume 1: Early Manuscript Books, edited by Jennifer Keith and Claudia Thomas Kairoff, associate editor Jean I. Marsden; and Volume 2: Later Collections, Print and Manuscript, edited by Jennifer Keith and Claudia Thomas Kairoff. The print edition establishes for the first time an accurate record of all known work by Finch that has survived: more than 230 poems (the number varies depending on how one enumerates different versions of some poems), two plays, and letters. 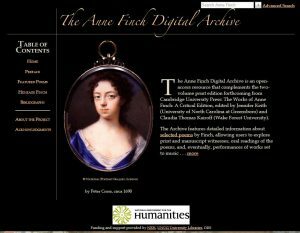 Already available is the open-access Anne Finch Digital Archive, which complements the print edition. Materials on the open-access Anne Finch Digital Archive enable users to explore the archival elements of Finch’s texts. The featured poems on this site have been selected from a great number in Finch’s œuvre to illustrate her work in different poetic kinds, including song, fable, biblical paraphrase, translation, verse epistle, and devotional poetry. For every featured poem, the site includes commentary with embedded links to illustrations, information about composition and printing dates and sources, audio files of the poem read aloud, and source copies showing authorized manuscript and print texts with transcriptions. We will continue to add resources to the site, including recordings of musical performances of the songs featured. The multimedia elements of this site reflect the various ways that Finch’s work engaged her contemporary readers and listeners, who knew her work in manuscript, print, or performance, or in all of these forms. Writing in an era known for the overtly public and political poetry of John Dryden, Jonathan Swift, and Alexander Pope, Anne Finch, Countess of Winchilsea (1661-1720), articulated a different literary and political authority. From her position as a female aristocrat, once at the center of the court and then for many years a political internal exile, Finch explored the individual’s spiritual condition as inextricable from social and political phenomena. Her interest in affairs of state frequently informed her exposure of patriarchy’s constraints on women and men. 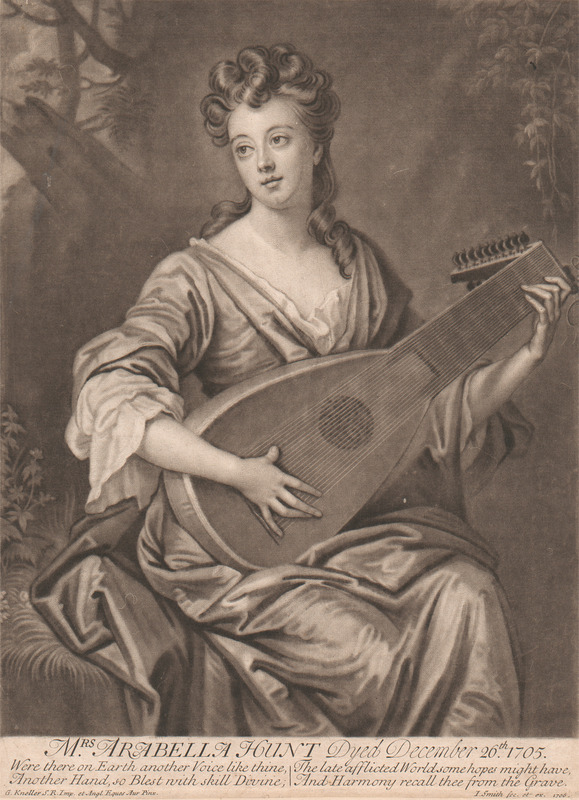 Finch’s work participates in the strategies of her contemporaries such as Dryden and Pope—the public speaker who sought to influence state politics, the renovator of classical mythology and pastoral who exposed contemporary mores, the fabulist who satirized state and society, the friend who used the couplet for conversation and exchange, and the wit who made discernment a moral good. But Finch both furthers and deviates from these practices. Readers will discover her innovative use of form and genre to explore a wide range of themes and her complex use of tone to enlist the reader’s discernment and develop a poetics of intimacy. The edition has received generous support from the National Endowment for the Humanities, the Folger Shakespeare Library, the Women’s Caucus of the American Society for Eighteenth-Century Studies, the William Andrews Clark Memorial Library, the University of North Carolina at Greensboro, and Wake Forest University. As any reader of The 18th-Century Common knows, the last quarter century has witnessed the astonishing digitization of thousands of texts from the past: novels, poems, essays, histories, plays, many of them available for free. For scholars, the creation of this Digital Republic of Learning has (on the whole) been a boon, enabling new modes of inquiry that could barely have been imagined a generation ago. For students, however, the digitization of the archive has been a more mixed blessing. As newcomers to the field, students can very easily find themselves overwhelmed by the sheer abundance of material that shows up in the simple Google search that is likely to be their first means of access. Students are unlikely to know how to judge of the quality or authenticity of what they find, or to be able to recognize the difference between a well-edited text and something with virtually no authority whatsoever. Texts are haphazardly distributed, some behind commercial paywalls such as Gale’s ECCO collection, while others are in reasonably well-curated but still imperfect archives like Project Gutenberg. Still others seem to have been put together with no thought whatsoever. In keeping with the tendency of the Internet to level the field of information, all such texts come decontextualized in several senses. Rarely are the texts that students or general readers are likely to find annotated to provide the kind of historical contextualization that most readers need to make sense of works from this period. And, too, the fact of digitization decontextualizes all works from the past from the conditions of their production and dissemination; everything looks the same on the screen. Our projects intend to improve the quality of eighteenth-century texts available for students, general readers, and scholars, and to enlist students in the project of producing them. 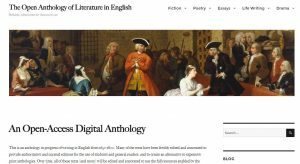 The Open Anthology of Literature in English aims to build a digital anthology from the ground up, offering digitized texts that have been edited for accuracy and annotated for modern readers. Students are crucial collaborators and makers in this project. Using the TypeWright tool at the 18th Connect project, they can correct the OCR of original texts, and in the process get to see what eighteenth-century print looked like. And they can identify what should be annotated (who knows better than they do what they need in order to make sense of a work from the past? ), and then research what they and readers like them need to know. They get to work with TEI/XML, which means that they get to see the digital tools of the twenty-first century print shop. As students complete texts, they become part of a permanent, open-access archive of reliable works, encoded in TEI/XML that is available for the use of teachers who want a place to which they can send their students. Students thus create something that lives on past the term in which they are enrolled in the class, and the community of students and readers get an archive of free and reliable texts that take full advantage of the resources offered by digitization. 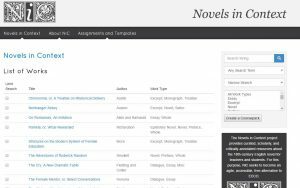 Novels in Context is a web-accessible TEI/XML database application focused on a particular moment in literary history. 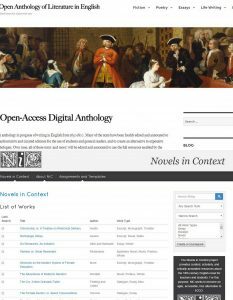 Drawing on the practice of public scholarship, the free code ethos, scholarship around the digital archive and digital edition, and the Open Educational Resources movement, Novels in Context seeks to provide a curated, extensible, searchable, and reusable collection of primary source materials focused on the eighteenth-century English novel. This project is unique not only in its use of database technology and the standardized TEI Simple markup but also in its commitment to the material page–each item is accompanied by quality page images sourced by hand from libraries and special collections. If everything looks the same on the screen, so too in print anthologies, which deracinate the text from its reality in time and space. Without understanding something about how a text or an utterance or a performance comes to be in our purview, agile, contextualized engagement with literature—much less the world at large—is impossible. By involving students in its creation, Novels in Context works to fulfill the promise of feminist pedagogical theory that urges both collaboration and connection, seeing students as critical makers—full, capable partners in the scholarly work of keeping our cultural heritage alive. While these projects work to improve the quality of digital texts in an open, collaborative, and scalable way, they also speak to another concern with the market-driven tendencies of academic publishing. The construction of a Digital Republic of Learning is and has been underway in myriad forms on the Internet since the 1990s, to be sure, but the past decade has seen a noted rise in the number of corporate fingers in the pot. To be committed to the public goods of education, we need texts and pedagogies that are public and open, but they also need to be critical, rather than affirmative. A user-generated open anthology of the kind we are imagining is a step in this direction. As the eighteenth century teaches us, power in the public sphere is in large part a product of one’s ability to negotiate its social and technical components. Looking toward the eighteenth century, which witnessed its own technological and social revolutions in the dissemination of knowledge, can also be of real use in our current educational context. Knowledge and power, knowledge-power: one of our most salient charges as teachers and scholars today must be to enable the fullest possible participation in public conversation. And when we say “fullest,” we mean it in the broadest sense—rich, responsible, free, purposeful, ethical, capable of enabling new relations of power, new relationships between our present and our past, newly connected selves. To that end, we seek collaborators on both projects, teachers and students who want to make creating digital editions eighteenth-century texts. We will provide TEI/XML templates and lessons to enable students to become active, critical contributors to the textual commons. Please contact [email protected] or [email protected] to find out how you and your students can join in the task of creating open, curated digital editions of texts from our collective past. The Eighteenth-Century Poetry Archive (ECPA) is a digital project in support of the teaching, study, and research of the poetry of the long eighteenth century. It comprises a full-text collection of richly-encoded digital texts and a research project that aims to integrate texts and (digital) scholarship into a curated research collection. ECPA is based on the principle of user participation, the corpus is edited and annotated collaboratively, and will grow and evolve with the requirements and interests of its users. ECPA was originally intended as a way of providing literary and historical context for its sister project, the Thomas Gray Archive, covering the lives and works of contemporaries of Gray’s such as William Collins, Mark Akenside, Joseph and Thomas Warton, Christopher Smart, and James Thomson. As the project evolved and widened in scope, its initial contextual focus shifted to an analytical one. ECPA builds on the texts created by the Text Creation Partnership (TCP) from Eighteenth Century Collections Online (ECCO). The transcription and encoding has been enriched with additional descriptive (e.g., author attributions on poem level) and analytical markup (e.g., recording verse, stanza, and poem form, assigning of themes and genres, assigning rhyme scheme, assigning metrical pattern, recording of syllable pattern, addition of explanatory/editorial annotations) in support of a computationally assisted close reading process. As readers engage with texts in different ways and with different objectives, we have modeled these different types of user engagement into distinctive “views” of the text. So far, we have focused on views that support a first reading of a text (“reading” view) and the initial analysis of a text (“analysis” view) in the form of a close reading. Over time, the ECPA research project will enable new modes of engagement and allow for increasingly sophisticated ways of interacting with the texts. ECPA is currently available in public beta and is in active development. Current developments are concerned with increasing the number of poets and poems represented, and exploring the possibility of including other European languages. We welcome any feedback about issues, feature requests, or general feedback about the content, functionalities, or design of the Website. Please e-mail <[email protected]>. Thomas Gray is most famous for his poem “Elegy written in a country churchyard.” It was an instant success, and even today it is the most visited page on the Thomas Gray Archive website. There is more to Thomas Gray than just this one poem, however. Born in 1716, he was one of the key poetic figures in the early Romanticism of the mid-eighteenth century. 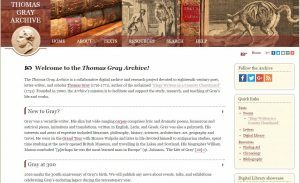 The Thomas Gray Archive aims to make all his writing universally accessible online, along with important secondary works and crowd-sourced comments from today’s researchers. The starting point for the Thomas Gray Archive was high quality digital scans of key editions of Gray’s work. As well as the images, the texts were transcribed using a standard text encoding format (TEI/XML). This allows the text to be searched, annotated, and analysed. The Archive now contains the full-text of Gray’s published poetry, a selection of his prose writings, particularly his travel writing and literary criticism, and his correspondence. There is also a digital library with digital images of key editions of his works; translations into other languages; his prose and letters; and with audio tracks of readings of a small sample of his poems. Not all of Gray’s poetry is as seemingly accessible as the “Elegy” or his humorous verse. In fact, given Gray’s background as a scholar poet, most of his poetry has always posed a considerable challenge even for professional readers of his works. In order to make his works more accessible to a wider readership, the Thomas Gray Archive includes a large number of explanatory notes and offers readers the opportunity to add their own notes and interpretations. This not only helps other readers access Gray’s work, but also demonstrates how an online archive such as this can transcend the single authority of a printed book, by presenting a range of authorities and readings. Today, the Archive contains more than 3,500 notes on Gray’s 74 poems. These range from basic notes on the meaning of obsolete or obscure words to elaborate interpretative glosses on the use of figurative language, or references to places, people, and events that have influenced or shaped his works. Any contributions of notes or queries on any level and of any length are very welcome and will enhance all readers’ enjoyment of Gray’s work. 2016 marks the occasion of Gray’s 300th birthday, and anyone interested in Gray’s life and work is welcome to follow the hashtag #Grayat300 on Twitter where any talks, exhibitions, and events in the UK and beyond will be announced during the tercentenary year. I would like to speak enthusiastically for the affinity of Cognitive Science and Eighteenth-Century Studies, with the stipulation that we acknowledge a reciprocal gain. The point of a dialogue between these two disciplines is not that contemporary cognitive models can somehow verify what eighteenth-century accounts of cognition primitively conjectured. The literary and historical texts that serve as “data” for Eighteenth-Century Studies look nothing like a modern laboratory experiment or brain scan. And yet these earlier accounts of cognition can be just as extensive, precise, and applicable to diverse realms of human experience. In the case of my own area of interest, attention, historical accounts are especially valuable because contemporary theories often emphasize attention’s involuntary and automatic function and sometimes question whether attention is even a valid concept. 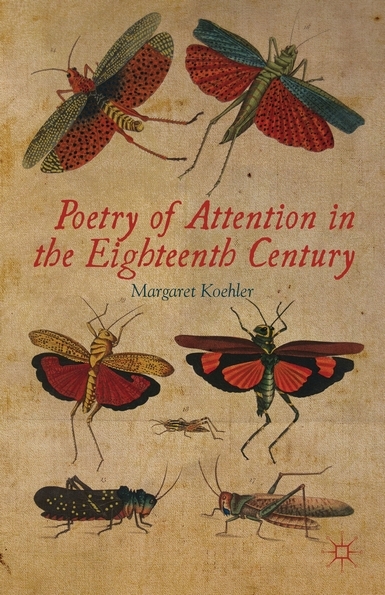 My book, Poetry of Attention in the Eighteenth Century (Palgrave, 2012) , makes a case for the relevance of eighteenth-century models of attention. Because the discipline of Psychology only turned to attention as an area of research in the late nineteenth century, studies have tended to ignore attention’s earlier conceptual history. My book attempts to fill one part of this gap by tracing debates about attention during a period of intense interest and significant revision of its meaning. I then look to poetry for documentation of the workings of attention. Literary texts are rich but surprisingly unexplored sites for tracing—and, for a reader, reenacting—the precise operations and recurring dilemmas of attention. To overlook the sheer range of attentive scenarios explored by literary texts and the meticulous evidence they record is to miss a unique set of data. I began this project wanting to understand the frequent references to attention in eighteenth-century poems. I had been particularly struck by a line from a 1692 ode by William Congreve, “On_Mrs. Arabella_Hunt_Singing.” In this line a listener wills himself to be fully absorbed in the song: “Let me be all, but my Attention, dead.” It seemed to me that this plea embodied a wider aspiration in the poetry of this period to experiment with perception—both to portray a poet’s states of awareness and to elicit a vicarious experience in readers. Eighteenth-century poems again and again stage scenarios of experimental attention. In addition to a moment of determined focus like Congreve’s, they explore a range of perceptual puzzles: How is it different to encounter something novel versus something familiar? How does perception shift when you are on foot, scanning the landscape while in motion, and then you suddenly zero in on some small detail? How does darkness enhance the other senses? How can a poet render the cacophony of a busy London street? I found myself wondering if the framework of attention might finally name a quality of eighteenth-century poetry that I had noticed but struggled to formulate. My dissertation had focused on the relationship between literal and figurative tendencies in eighteenth-century poetry, particularly on the way that certain images seemed to “fluctuate” (as I put it) between the two states. But these terms had come to feel inadequate. What if I could articulate a related phenomenon more accurately as the poet’s—and the reader’s—shifts of attention? Part of the reason I had first become a fan of eighteenth-century poetry was because it prompted me to notice and appreciate small details in the natural world. Right around this same time a student in my eighteenth-century literature had made an offhand comment that seemed to capture the challenges of teaching this material: “I don’t like reading poems where I have to keep stopping to think about every word. I like it when poems just flow.” In other words, he was frustrated by the attentive demands and had expected poetry to offer easier, more passive pleasures. My teaching and research were dovetailing in a rare and exciting way around questions of attention. My immediate impulse was to turn to contemporary theories of attention for explanation. Working through recent studies of attention by psychologists, I found myself at first assuming that eighteenth-century accounts offered embryonic accounts of phenomena that contemporary researchers had gone on to explain more fully and correctly. Then when I returned to the eighteenth-century texts, I was in some sense looking for the twentieth and twenty-first-century models: attention as selection versus attention as enhancement, attention as a set of distinct processing resources. I had for example been fascinated by a 1950s lab experiment in “dichotic listening,” (subjects listened to headphones that fed one sound input on the right and another on the left). Subjects were told to attend deliberately to one particular side, then later had to report on what they recalled from the “unattended ear” (early versions of the study found that they recalled almost nothing; later versions found more). This notion of the “unattended ear” felt richly applicable to eighteenth-century poetry, which often challenges readers with competing inputs—high and low, vast and minute—and asks them to reconcile the incongruity. But rigidly applying the processing model to poetry felt both formulaic and inaccurate. The more useful insight was that eighteenth-century poetry complicates and mocks the very possibility of allocating attention dichotically. Creativity may well lie in escaping, not giving in to, our autopoietic machinery and focusing carefully on the world. This proactive proposition defies a hyper-Romantic theory of consciousness…that we can never perceive the real world but only our mental representations. One way to escape a hyper-Romantic theory of consciousness is to look back to earlier models. I would argue that this call for a new aesthetic commitment to “outward-directed attentiveness” finds a vital precedent in eighteenth-century poems. When we sit down to appreciate the value of a poem or of a painting, and attend minutely to the language or composition of the one or to the coloring or design of the other, we feel no longer the delight which they at first produce. Our imagination in this employment is restrained, and instead of yielding to its suggestions, we studiously endeavor to resist them by fixing our attention upon minute and partial circumstances of the composition. While Alison explicitly opposes attention and imagination, eighteenth-century poetry demands their co-existence. Attending to details of a scene is part of the imaginative response to it. This aspiration is one of the reasons why eighteenth-century texts can seem difficult and alien to contemporary readers, who have inherited a Romantic aesthetic. My book repositions eighteenth-century poems as a collective model for assiduous reading and supple, wide-ranging attention. It identifies a genuine insight that Eighteenth-Century Studies has to offer about cognition: that active, deliberate, and demanding attention is a crucial component of imagination. Barbara Maria Stafford, “The Remaining 10 Percent: The Role of Sensory Knowledge in the Age of the Self-Organizing Brain.” Chapter 2 in Visual Literacy, ed. James Elkins (New York: Routledge, 2008), pp. 31-57. Barbara Maria Stafford, “Neuroscience and the Future of the Art Museum.” Talk at the High Museum of Art, Atlanta, GA (March 2007). Stafford, Remaining 10 Percent, p. 33. Stafford, Remaining 10 Percent, p. 42. Stafford, Remaining 10 Percent, p. 45. Alison, Essays on the Nature and Principles of Taste (Edinburgh: J.J.G. and G. Robinson,1790), p. 7.